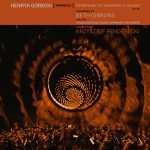 The Quietus has an exploration into Beth Gibbons’ new recording of Henryk Górecki’s Third Symphony, one that delves into the history of the work – and its huge success on the British charts – and places this new version into a larger context. It’s a very informative read for anyone who has been captivated by the “Symphony Of Sorrowful Songs” and would like to learn more. Read it all right here.